It is with a heavy heart that I tell you some sad news. Pixie had a talk with me, and she told me that she was ready to go to the Rainbow Bridge. Pixie left us this morning. 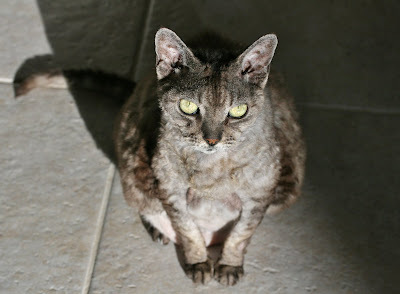 Most of you know that Pixie has struggled with feline hypertrophic cardiomyopathy for over 6 years now. She was very tired and sad, and I do not think she even enjoyed her toys very much. 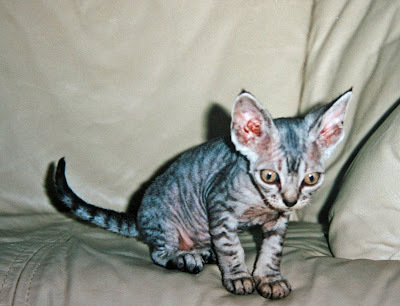 Here is Pixie as a little baby kitten. Back then she loved to run and jump and twirl and leap around. Then, her heart got broken and she could not do all the fun things she used to do. Over the years, her heart became worse and worse. But she was always brave and took all of her medicines. I know Pixie would not want you to be sad. Maybe you could eat a bananer today in honor of Pixie. Pixie, I will meet you again when it is my time to go to the Bridge. Rest in peace, sweet Pixie, my sister. I am so so sorry!!!!!!!!!!!!! Big big hugs to you!! Daisy!!!!! Oh, Daisy, I am so sorry to hear that Pixie has gone to the rainbow bridge. It is always so hard to say goodbye. I am sending you and your mombean and the dadbean purrs. know she will be waiting for all of you when its your time. Oh Daisy, I knew something must have happened when you hadn't posted early this morning. I am so sad to hear about Pixie. My sister, Muff, will welcome her and keep her company until we can all be with her again. Oh Daisy...I'm so, so sorry. Perhaps she and my Sprout can cuddle together. My friends wait for me over the bridge too. I cherish all their memories. You are in the best of company until we all meet again. I send my deepest sympathy to your Mommie and Daisy. honey i am soooo sorry. you know i think of her every time i eat a bananner! and i always will... i am very sad about this. That brought tears to my eyes, Daisy. I'm so sorry for the loss of your sweet friend, but at least she won't have to be sad anymore. Hugs to you and your Mommie. I am so sorry Miss Daisy, we will all miss Pixie. Daisy, I am so sad to hear about Pixie going to Rinbow Bridge. I know you and Mommy are very sad right now but know that Pixie is feeling so much better now. She will still watch over you! Darling Daisy, I am so sorry that Pixie had to leave you. She had been a brave girl but now she can rest and run again at the Rainbow Bridge. My love to your mommy and daddy who must be so sad. I will eat a banana today in honour of Pixie. Purrs and headbutts. Poor little Pixie ... bless her little heart. We are so sad for you and your family. Pixie, you will be met with open paws at the bridge, and look for a gray and white tuxedo names Fluffy, he'll take you under his wing and look out for you. I'll try a banana today in memory of you. Condolence to you Daisy. I am so sorry to hear it. We are so very sorry. It hurts us to think you had to say goodbye to your sweet little girl. We unnerstand how you are feelin' this mornin'. We promise you this...our dear Felix was right there waitin' on Pixie. He is a caregiver...takes care of every cat he meets. He's up there right now showin' Pixie the ropes. You don't need to worry. He'll make sure she's okay and gittin' all the nanners she could ever want. We are prayin' for you. I'm so so sorry, Daisy - this is just the saddest news of all. I'm sure your mommy is hurting a lot too, so you must be very loving to her. I'm sure Pixie will find many friends to keep her company until you can join her. Please accept our most sincere sympathies on your loss of Pixie. We know that your Mommy and Daddy's hearts must be broken. We will light a candle for her right now to help her on her way to the Bridge. I will try to eat a piece of bananer today in honor of Pixie. Hugs and gentle healing purrs to you and your family on this most sad day. Daisy, we are so sorry. We will definitely try a banana today. You and your Mommie and Daddie are in our thoughts and prayers. Please give your Mommie lots of purrs and biteys for us. She's had a rough few weeks. Rest in peace, sweet Pixie. No! Pixie! You cannot die! I will be sure to eat a banana in honor of you today! Daisy, I am so sorry! I hope you and your mommy feel better very soon. I am sure Pixie wll be very proud of you for staying strong. I am so very sorry Daisy! OH my We are SO sorry to hear that. We are sending purrs to everyone at your household. .
Daisy, I know you'll miss Pixie a lot. But at least she's not suffering anymore and she was able to tell you how much she loved you and give you a "till we meet again". We're sorry for your loss and will be thinking of you at each bananer. Oh Daisy! We are so very sad for you and your Mommy! Our brothers Flapjack and Boomer will be on the other side of the bridge waiting for Pixie with lots of toys and treats to share. They will take good care of her and show her all the best places to play and nap. Oh Daisy, we were so sad to hear about Pixie. You must all be heart-broken, and we send you lots of purrs and licks of comfort. Pixie will have many, many friends waiting for her at the Bridge, all the "ones that came before." Daisy, this is such sad news to hear. We came earlier to read your comic and when it wasn't there, we thought something must be wrong. We are purring for you and your family. Pixie can run free and happy at the Bridge, and her heart is whole and healthy again. love(((hugs))) and purrrs furrom Eric and Flynn and our mum. Oh we are sooo sad to read this. Pixie is in the best place for her now, and will be running and playing until you all meet again. Daisy we can't tell you how sad we are about Pixie's passing away. 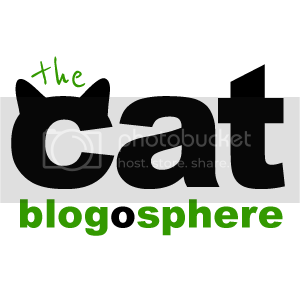 We went over to the cat blogosphere to see your Sunday comics link but couldn't find it so we came over to your blog thinking that something must be wrong, since we didn't find your post update on twitter either. We are so so sorry to learn that Pixie has gone away and you are now alone with your Mom and Dad ~ we know though that Pixie was well loved her entire life and went away peacefully. You are a very brave cat and we are glad you are taking the loss well. We don't know what we could say or do to make you feel any better but if there was something, we'd have gladly done it. Please accept our deepest condolences, purrs and purrayers for yourself and your family. Daisy, Mom and I are so sorry to hear that Pixie has gone to the Bridge. We are sending purrs, headbutts and hugs. So sorry to hear about Pixie. I enjoyed reading about her, and I love the photos of Pixie eating bananers! Oh Daisy, I'm so sorry to hear about Pixie.. It's such a sad time but I'm sure she is happier where she has gone..
Kneads and purrs to you Daisy. I'm so sorry for your loss. I am so sorry to hear this news! I am so sad for you and your mommy right now. Please know that we are thinking of you and we send you lots of purrs and purrayers. I hope Pixie will get to know my sister Taffy at the Bridge and become fast furry friends. Oh no. Daisy, I'm so, so sorry to hear about Pixie. My deepest sympathy to you, your Mommy and Daddy. Take care. no! no! no! this is just too sad. we will miss all the nanner stories and pictures and pixie's pretty face. oh daisy and mommie, we are so sorry to hear this new this morning. pixie will be the queen at the rainbows bridge. We are so sorry to hear about your loss. I hope our little Tigger finds Pixie so she can show her the ropes. Ohh Daisy, we are so sorry. Mommys eyes are leaking real bad right now. She loves Pixie and you and comes to your bloggy every day. Mommy thinks about her every time she eats a bananer. She will have to go to the store today to buy some in remembrance of her. Sending you and your mommy lots of purrs and headbutts. We love you! Daisy, Mom & Dadbean we are so sorry to hear of Pixie going to the Rainbow Bridge! Our eyes are leaking and we will eat a banana in her honor today!! ((((((((Hugs from our house to yours)))))))! Oh Daisy, I am so sorry. You, your mom, and your dad are in my thoughts. Oh no :( We are so sorry and so sad that Pixie had to go on to the Rainbow Bridge. We didn't want to say goodbye so soon, even for now til we get to the Bridge with her. Mom is lighting a candle for her and we will eat naners in her honor today. We love you and are sending lots of purrs of comfort for you and your fambly. I'm so sorry for your loss. I know how much you loved your sweet Pixie. It is some comfort to know that she is now happy and healthy and playing with all her friends, but her loved ones left behind are suffering greatly. Gus, Prudence, and I send you our love and sympathy. Daisy's Mom, I am so sorry for your loss. Losing a pet in many ways the hardest kind of loss. Your post was lovely, and I am not embarrassed to say it made cry. Honor Pixie by showering Daisy with love, let her fur absorb your tears. And when you are are ready, expand the love by bringing another fur person into your home and giving them the best life possible. Oh Daisy! We started visiting and someone mentioned this. It is such a shock to learn about Pixie. We are sending good thoughts to you and your Mom because we know that Pixie was a very much loved girl and she will be missed. We hope you do not mind if perhaps we just be nice to Georgia (our old lady cat) rather than eat a banana in her honor. We are not very fond of bananas. OH Daisy, we are all VARY sad about Pixie. The nyce laydee has leeky eyes!!!! I hope yoo are feeling ok. I will purr for yoo!!!!!! Oh no Daisy! We are so very very very sorry to hear that Pixie has left and gone over The Bridge. We are deeply saddened and Maw is crying for Pixie and you and your dear parents and grandma. Know that our love and deepest purrs and purrayers are coming your way. We are all so sorry for your loss. Our deepest purrs to your family. We will miss Pixie so much. We're going to go find a bananer and share it in her honor. We are so so so sorry to hear about dear Pixie. She was such a brave and dear kitty. Her heart isn't hurting any more, it is now filled with love and happieness and healing and she is over the Bridge waiting until you are reunited. Pixie lived a wonderful life-13 years with an illness is a tribute and in her honor I shall do something special for our cat rescue here in Highlands this week, and today I'll plant a little plant in my yard for Pixie. ( I have side garden for the departed kitties) I'm working there anyhow. I know you shall miss her sweet presence, that's the thing when we lose pets their presence is so much a part of our every day existence and there is never another exactly like her. I hope when the time is right you will get another to carry on her legacy of feline caring..I am crying a lot..Princeman, Sweetheart Handsome, Evie, Toppy, Super Waddles, and Pinky..Be brave sweet Daisy ..
You were brave to let Pixie go to where she no longer has to be sick. What a wonderful life she had with your family. We will definitely eat a bananer in her honor. I had the feeling that your sister was going to leave you soon...At least you can take comfort Pixie's no longer in any sort pain, even though I know your mommy did her very best to care for her. Daisy, we are all so sorry to hear the sad news about your sister Pixie. We're sending comforting vibes and purrs to you and your family. I'm so sad to read this. I don't know what to say except your dear Pixie will live on in our hearts. My thoughts are with you. Our hearts feel so sad with you. We loved your special Pixie with her love of nanners, and Mom's crying and, well, we know she's safe and happy at the Bridge but we'll miss her lots. We are so sorry. We know she will watching over you and your mommie, and she will be waiting for you at the Bridge. Peace to all of you. Oh Daisy, this is such sad news. Our eyes are leaking and our heart is broken for you and your Mommie and Daddy. We know that Pixie was sick and ready to go, but it doesn't make it any less painful. We're sending purrs and hugs to you all. We'll see you across the Bridge one day Pixie. And we'll be eating 'nanners in your honor tonight. Oh no!! We are so sorry to hear that dear Pixie has gone to the Bridge. Mommy's eyes are leaking. We just knew something was wrong when we logged in and your comics were not posted. Please know that you and your family in our our thoughts nad purrs. Pixie will be very much missed. We are so sorry. We know that Pixie will be watching over you and your Mommie, and that she is waiting for you at the Bridge. Peace be with you. Farewell sweet Pixie princess. You will be missed. Hugs to you Daisy and your Mom and Dad. Oh, sweet Daisy, our hearts are breaking for you and your family. We know how much you'll miss Pixie, but let it bring peace and warmth knowing that you gave her such a wonderful life and that she'll live forever in your hearts and in all of ours. We're sorry to read about Pixie's passing to the Bridge. We know you will all miss her very much. Remember all the fun times you had with her. We'll see you at the Bridge, dear Pixie. The mom gotted all leaky eyed and we ran to see... We is sorry to hear Miss Pixie haded to go. we are fery sad to hear that pixie has went to the bridge. we will be keepin yur fambly in ars purrayers. rest in peace sweet pixie. I am so very sorry for your loss. You were a good sister to Pixie. Her life was filled with love and care because of you and her beans. Peace and may light perpetual shine upon the lovely Pixie. Daisy and Family, we are so sorry about Pixie. She was a very special kitty. We purr for peace and comfort at this difficult time. I'm so sorry for you Daisy, and I'm sorry for your human friends, too. We are very sorry to hear about Pixie. We will eat our first banana in honor of her today. Our sister, Rita will be there to meet her at the bridge. Oh, Daisy, I am so sorry for you and your momma that it was time for Pixie to go to the Bridge. She was such a brave lady-cat, and I hope it is a comfort to know that her heart is all fixed now that she is at the Bridge and she can run and jump again and play with her toys. I know she will be in our memories forever. I am sending you purrs and furs in sympathy. I am sure my cat Omi will be there to welcome Pixie too. So many sweet friends have gone to the rainbow bridge. Love and hugs to your mommy and daddy Daisy, and to you. I am so so sad to hear of your loss... My cat passed away in March after 19 years of companionship and I'm still grieving. 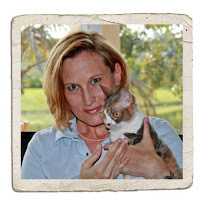 Sweet Pixie, if you see a calico cat by the name of Berliny, know that she enjoyed reading you and Daisy on the blog. You will have a fast friend. Oh Daisy..We are so sorry to read the sad news about Pixie. She was such a good sisfur to you. Momma has leaky eyes and can't type much right now. We want her to put Pixie's picture on our blog. Sending many gentle hugs to your Mommie and Daddy. Dearest Daisy! I am ever sosorry to hear that our sweet Pixie has left for her final journey up into the heavens. I know that your beloved Haiku and Cricket meezer kitties were waiting for her at the end of the bridge to welcome her inside. My Henry kitty had HCM and left us on his 3rd birthday...we are still missing his soft purrrrr. Oh Daisy and mom, we're so sorry for yoor loss. We will all have some banana in honor of Pixie. We is also glad. Glad Pixie won't be sick any more and won't hafta take medisin and can run and play and have fun. Oh, Daisy, we are all so sorry to hear of the passing of your sister. We know you and your mommy will miss her very much. I am so, so sorry to hear this news. We have lost two of our best friends and it is such a hard time. Take care. We are so sorry to read this, Daisy. Our new Angel Flinders will be there to greet you at the bridge. Love and hugs to you and your mom. We are so shocked to read the news! We knew she was ill of course but had no idea she was so close to the rainbow bridge. Our hearts go out to you Daisy & Mom. We know she will leave a big void in your life but you have so many happy memories of her to comfort you. We are so sorry to hear the sad news that Pixie went to the bridge. Our eyes are leaking. She was loved so dearly by so many. Our thoughts are with your family and we're sending lots of hugs and purrs. We are so sorry for your lost. We are very sad! Dear Daisy and family: I'm so sorry to hear this sad news about Pixie. She's not suffering any more but I'm sure you will still miss her. I hope you all feel better soon. Oh Daisy, we are so very sad. We have leaky eyes, first for little Squirmy yesterday & now for Pixie. Maybe they are playing together at the Bridge, that thought makes our hearts smile. We are sending love & purrayers to you & your family. I am so very sorry. :( Deep sads from my heart. I am sending lots of love your way. Pixie will be happy in heaven and she loves you, Daisy. We're so sad to hear about Pixie. We knew something was wrong when your Comic post wasn't up this morning. Pixie was a strong girl to fight her disease for so long. She is young and healthy at the bridge now. (((Hugs))) and headbonks to you and your Mom. We'll send healing purrs out to you. Oh, we are so sad for you and your family. Dear sweet Pixie. Our Mom's eyes won't stop leaking and she is holding us close. We will never forget you, Pixie. We all loved and admired you.Daisy, please cuddle your Mommie. She really needs it. I am so sorry. Purrs and headbutts to you, your Mommie and Daddy. I know you will miss Pixie. Oh, sweetie ... We're so sorry. You have our deepest and sincerest condolences on the loss of your sister. Pixie was so much a part of the blogosphere that her passing has left a hole in all of our lives. She will be in furry good company as she waits at the Bridge. Oh no! We're so very sorry to hear this sad news. We've got one bananer in the house (the Lady needs to go to the store), and we're gonna chop it up and all share it while we purr for Pixie. Love, purrs and hugs to all of you. We are so sorry to hear of Pixie's passing. Our thoughts and prayers are with you and your family. We are so sorry to hear about Pixie. We will be purring and praying for you and your family, Daisy. Miss Daisy, I am very sorry for your heart, and your mommie's heart and your daddie's heart. I know there is a Pixie-shaped space there that lies empty now, but for good memories and the affection with which she held you all. Please know that my mom and I are sending you purrs and lots of love and sympathy. Oh no. We are so sad to hear about Pixie. Huggs and Purrs to your family. Pixie won't feel pain or feel sad anymore. Bless her heart. we are so sorry to hear that Pixie has left you & the beans to go to the Rainbow Bridge. We know you must be very sad and we share your sorrow. We are sure that now Pixie is in a place where her heart is fixed and she feels like running and jumping again. Oh, Daisy. I'm so sorry. I would eat a banana today, except I don't really like them. But, every time I see a banana now, I will be forced to think of Pixie. Daisy,we are so very sorry. We cannot help it,our eyes are leaking!!! We know she will be met by all the wonderful cats that have gone before. ((((((((((((((HUGS))))))))))))))))) to you and your Mom & Dad. We are so sorry to hear about pixie. You made sure she had a wonderful life and she was so lucky to have you to love her. You looked over pixie for 13 wonderful years and now it's pixie's time to take care of your family from up above. Oh, Daisy! We are so sorry to hear of Pixie's crossing the Bridge. We know she had a valiant fight with her illness. Our hearts go out to you, and your Mommie and Daddy ofur her. 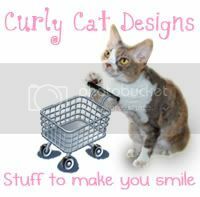 We are purring, purraying and sending [[[hugs]]]] your way. Evita is at the Bridge to meet her. We will eat bananers in her memory today and think of her whenever we eat one. Please let us know if we can do anything for you. So sorry to read this morning about Pixie. It's good to know that you'll see her again one day. Oh no......Meowms and our eyes are laking. We are so sorry. Pixie was such a fighter. We are so sad that she is gone, but so glad that her heart is no longer broken, it is just broken hearts she has left behind. Sending all of you hugs and purrs. I'm so sorry to hear about Pixie. I keep all of you in my prayers. And Pixie will be waiting for you. I am so sorry for your loss. I wish I would have known about the Rainbow Bridge when we lost Sailor. It would have made it easier. She left us 4 years ago from behind our Christmas tree. Perhaps they can play together. Again, my heartfelt condolences. Oh Daisy, you must be so sad, but Pixie is happy now and she is not old. Going to the Rainbow Bridge must feel good if you are old and sick. Oh, Daisy... we are so sorry for you & your Mommie. We know Mia will show Pixie where all the banners are at the Bridge. i'm so verree, verree sorree to heer abowt pixie. u were alwayz such a good sistah ... an mudder to her. i know dat mi sistah kallie will meet her at da bridge... an dey will run togedder like kittenz again! Dear Daisy, we are so sorry for your loss. We know it must be very hard for you to lose your beloved sister. Daisy, we are so sorry to hear about Pixie. Mama is leaking right now. We are purring for you and your mommie and daddie. Daisy, I know I don't blog anymore, but I do read many blogs still everyday. Yours is one I read everyday. I got on the computer to tune into some Sunday Comics with Daisy and instead read the bad news. I'm not sad, though. Pixie lived a long time with a broken heart. That is nothing to be sad about. Tell your mom Henry and Charlotte and Clyde and Mar and Cliff said Hi and we love you all. Daisy we were surprised and sad to hear about Pixie. We know you and your mommie took such good care of Pixie and she had the best life. She was so loved. We're thinking of you and your family today. Oh, I just read about Pixie! I'm so sorry for the loss of your beloved family member. I was worried when I saw that you had not posted this morning. Pixie was such an adorable sweetie! I know that she is enjoying friends and good health at Rainbow Bridge. I will think of her everytime I eat a banana. Please know that I am thinking of your family. Stay strong and take care of your mommy. Oh Daisy we are so very sorry Pixie had to leave you. Our hearts are crying for your loss. Please snuggle your Mommie and Daddie extra hard. Oh, Daisy, we were so sad to hear about sweet Pixie leaving for the Rainbow Bridge. We are sending over soft purrs for you and your family. We will always think of Pixie when we see bananas - we may even taste one in honor of Pixie. Judging by the comments, you have lots of friends to help you through this difficult period. Buddy, Chloe, Colby, Chrissie and even Copper the dog send you hugs. I'll tell my human's kitty angel Tinker Bell (2033-2006) to welcome her to the Rainbow Bridge for you. We are so sad that Pixie has left you, and we will be keeping you in our thoughts. My Mommy is crying very hard, Daisy. she is sad for you and your Mommie and Daddy. We will miss Pixie very much and we wish you could feel the love we have for you. We are so sorry for your loss. P.S. Pixie ... God Bless You! Run free. Love you! I can't help but I'm crying... Poor Pixie... My heart goes out to you and your parents, Daisy. Daisy! We are so sad to hear about Pixie. Purrs to you and your mom. Rest in peace, Pixie. :) God bless, family. My mom, my sister the d-o-g, my dad, and I enjoy following your adventures, and were very sad to hear that Pixie had passed. It made our hearts ache for you and your family, remembering how much it hurts to lose a member of the kitty family. Blessings on Pixie, the brave little kitty, and her wonderful family. We'll all meet up again one day at the Bridge. In the meantime, Pixie's spirit will always be with you. I'm very, very sad for your loss. Maxx and I will share a bananer today in Pixie's honor. God bless. Our family would like to extend condolences, love and well-wishing to your family. We understand what it's like when a member of the family dies and hope that the knowledge that Pixie has gone to the Rainbow Bridge (and that there are probably bananas galore there) will console you. Kilroy, Macy, Leah, Sadie + the beans. Oh. Daisy, I'm so sorry. Purrs and headbutts to you and your mommy and daddy. Oh Daisy, I am so sorry to hear about Pixie's passing. Please give your Mommie and Daddie lots of sandpapery kisses as I am sure they are very sad. Be well sweet Daisy, I am thinking of you. we were so sorry to hear the news about Pixie Bananas. I know that she will be your angel and will look after you. Sending you big bear hugs from across te ocean. I am sooo sorry! Pixie was loved and will be missed by so many! I will eat a bannaner in her memory. My thoughts are with you! We are so sorry to hear that Pixie lost her battle. HCM is very scary- our Mum has it and she feels tired all the time, too. We will purr and light a candle in Pixie's memory. Daisy and family, I just read the news about Pixie and I am so sorry for your loss. But she is not sick any more and she does not have to take medicine any more. You know that you gave her such a lovely life and family and helped her to enjoy her life as much as she could despite her illness and you gave her bananas! Maybe she has met my sister Hattie at the Bridge by now and they are having a nice girly chat while they are waiting for us. Sending you my loudest purrs and some of my best Eric sandpaper licks. Our thoughts are with you. Fat Eric and his mum, Kate. I did not have the privilege of knowing Pixie, but I know she was loved and will be greatly missed! As you said, she is now in a happy place filled with lots of friends and love! You and your family are in our prayers! good for cats and that she doesn't have one anyway. we also found several others with posts about Pixie. It must feel good to know that so many others care about you and Pixie. OOOhh No Daisy. were so sorry ta hear of Pixies passing. we know yoo loved her sooo much, she was yur sissy and a cute banana eating kitty. we are sending huggs yur way. Oh my i'm so sorry to hear the news! You don't know me, but i'm Tesla's Aunt. Since her mommy helps me blog, she decided to stop by with my account- and say i'm so sorry. She will be missed, and we will light a candle in her honor tonight. Sorry to hear about Pixie. I hope she gets all the bananas she can eat on the other side. Daisy, we are so very soryy for you and your mom. We send you our thoughts, our purrs and hugs from way over here in Australia. We are so sorry to hear this sad news. From Leslie and Pyewacket and Trixie and Tigger. We are so very sorry to hear that sweet Pixie went to the Bridge. She was tough but needed a rest. Our purrs go out to you and your mommie and daddie. Daisy we are so so sorry to hear Pixie is gone. It's good you had a last talk and she explained everything to you. We know you and your mommie will miss her badly. We are sending gentle purrss and comforting hugs! Momma gave us a bit of a bananer to honor Pixie! Oh Daisy, our hearts and prayers go out to you and your family. We will have bannaners today and think of lovely Pixie. We love you and your family. Sending purrs and snuggles to everyone! Every time I eat a banana I will think of you, Pixie...and I eat a lot of bananas. Big hugs to you and your family, sweet Daisy. I am so sad to hear that Pixie has gone to the Bridge. Roscoe and my cousin Perry and our other departed furriends are there to keep her company until we all meet again some day. Oh, Daisy, alla us Ballicai are leaking and Momma is, too. She sends huge huge huge squishy hugs to yur Mommie. Pixie had such love and such wunnerful care, and she will always and fureffur be loved and she will always watch ofur you and yur fambly frum the Bridge, and eatin lots and lots of bananers. We are so sorry, and we send you heart fulls of love. We are here for you, and we love you. The Ballicai -- MaoMao, Dorydoo, Brainball, Marilyn and the Ballicus Beans. Oh my dear I am soooooooo sorry for you loss Daisy. My heart just broke into a million pieces for you, loss of a love one is not an easy thing to bear. You will be in my heart and prayers today and always. Wahhhhhhhh! We will purr for your Momma an Daddee an Daisy who will miss you furry much. We are happy tho that you are well again an da Bridge gots to have lots of bananers an you can eats all you want now! Daisy studied so hard to try to help but dere are sum tings dat eben da vettie can't fix. We are furry sorry an we will miss you. I read your blog every single morning, it makes my day start out on a happy note. I am so sorry to hear that Pixie has gone to the Rainbow Bridge. My heart is breaking for you. Even though Pixie's heart is better now, I know it's hard to be without your best friend. I will snuggle my baby Callie even more tonight for you. Give your Mommie an extra snuggle tonight too. Oh no, I am so sorry to hear that Pixie went to the Rainbow Bridge today. I came over as soon as I heard. Too many of our dear one have left us and it makes us so sad because we now cannot see them. Just try to remember that Pixie no longer is ill but healthy and can run and play with her friends that have gone before her. Roscoe will, I am sure, be there to greet her along with Emil and Anastasia. Your prayers are in my thoughts. Be sure to let your mom have extra hug time with you while she is feeling sad. Purrs to all at your house. Farewell Pixie you are now with a healthy heart, free to run and play. Lots of purrs to Daisy and your beans on your loss. dearest miss daisy--it is bitter indeed to hear that sweet pixie has left us all behind. we aches for you an' yer fambly, an' purrs an' purrrays for your solace an' peace. We just haz no words, but we did not want to "not" say anything.. It feels like a family member of ours has crossed over. Dearest Daisy and Momma Daisy we feels so tight insides right now, iz so very sad to think that you won't see someone for a long time but yet it is nice knowing that poor Pixie is probably eating nannas till she pukes and running the quarter mile 7 times!! I am making momma buy me a nanna today and will try and eat it. My heart is very heavy for Pixie and my mum's eyes are leaking. I am purring for all of you today. At least you know Pixie has a new heart and can enjoy all those bananers now. I am so so sorry Daisy. Ben and Randy lost Seras almost a year ago from FIP, and he was only 11 months old. We feel your pain. Ben whispered in my ear after he had died, and asked if I knew he was going to die so young would I have chosen another black kitty instead of Seras. I knew then I would have taken than 11 months with him, than without! Hugs to you! This is the hugest shock! All of our eyes are leaking so hard right now. We just lit a candle for you, sweet, dear Pixie. We are just at a loss for words. You are all in our thoughts and purrayers. Everytime we play with our nanners and mom has her daily nanner, Pixie will be thought of fondly. I know you said that Pixie wouldn't want us to be sad, but we can't help it. We're cryin' and cryin' for you. I don't blog myself, but I have followed your blog for about a year now. I am sorry to hear about Pixie. You took such great care of her while she was ill, and she was much loved. I would tell you that my own Rainbow Bridge kitty, Zachary, would be there to welcome her, but, well, he was a very shy guy, so I'm sure he's just watching her from under a bush somewhere. Adios amiga Pixie, cuando sienta el olor a banana recordaré tu linda carita. This is such sad, news, Daisy. We're all thinking of you and purring for you and your family. Good bye Pixie, enjoy ur bananaz at da bridge. Purrz tu u Daisy an ur hoomans tu. Hugs, thoughts and love to you all. I have a human friend who struggles with HCM. I can only imagine how hard it was for a kitty like Pixie to live with it. I know your heart is broken... Hugs, my friend... hugs. Ohhhhh poor Daisy. I am so sorry to hear that your sister Pixie won't be around to play with you anymore. It is so good though that you understand that she is happy on the other side of The Bridge and will be with you always in your heart. I don't have any bananers on hand today but I will get one tomorrow when I go out and eat it in honor of Pixie. Bless you, your Mommie, and your whole family as you grieve the loss of your sister. Our thoughts are with you. Oh no oh no....the day which I had feared has come at last...we are all very sad here. I am so so sorry, Daisy and Momma.....hugs to all of you. Godspeed, Pixie, walk bravely towards the light and cross the bridge. We shall meet again. I WILL have a bananer today, to honor Pixie. I'm so sorry Daisy. My deepest sympathanies to your and your mommie. I couldn't help tearing up. Sympathies. OHHHH NOOOO! We just learned about Pixie from Skeezy. We are furry sad to hear da news - Mommakitty is leaking all over da place (and so are we). We know that Pixie is safe and happy on da other side of da bridge, yet we know it is furry hard to have her leave. We will all miss her furry much. 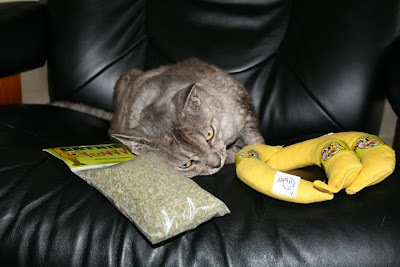 We are sendin' you all our purrrs and headbutts today - and we will ALL eat some nanners today. Peace be wif you all - we luvs you. I'm so very sad at hearing this news. But I'm also very glad that Pixie had a loving family who cared for her all the years of her life, right until the very end. Love to everyone who loved Pixie. I am so sorry to hear about Pixie. Sure she is free of pain at the Rainbow Bridge. Prayers, kisses and hugs to you all. My heart is full of prayers for you. I believe Pixie is happy at the Rainbow Bridge. She will be missed by many. Oh Daisy we just found out. We are so so sorry to hear about Pixie. We will miss her very much. We're thinking of you all. Oh Daisy..., we are so sorry and sad. 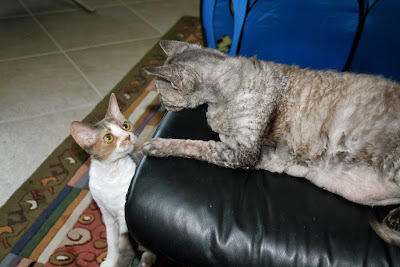 Pixie was such a special kitty -- a bananers loving Rex cat and so brave although her HCM. But at the Bridge she is young and healthy again. What a wonderful thing to say about the Rainbow Bridge. I know Pixi is happy and eating lots of bananas there. I too, believe we'll be reunited with our beloved pets. Purrs of sorrow from Gretchen and Mike....big hugs for you all, too. I wish I could be there give you big good hugs. I don't eat banana, but I have already ask Michico eat banana in honor of Pixie. Hoping Pixie will be happy! I am so very sorry to hear of the loss of Pixie. She is a beautiful kittie and will surely be missed. I know she will have lots of old and new friends to play with at the Rainbow Bridge. My Hobbie cat is there waiting for me and I know he would love a beautiful friend like Pixie. You have my heartfelt sympathies. We are so sorry to hear the sad news about Pixie. Our sympathy to you, Daisy, and to your mom and dad. You will miss her. We will always remember Pixie with her bananers and we will miss her visits to your blog. Goodbye Pixie, may you feel well and happy at the Rainbow Bridge. We are so sorry. You are all in our purrs and purrayers at this furry sad time. Oh, Daisy and Mommy too, we are so sorry for your loss. What you wrote about the Rainbow Bridge made all of us cry together and remember the love we have shared, and how special our loved ones are. How wonderful to meet again at the Bridge. We know you miss Pixie very much and how lucky you are to have had her for your sister. She was a good girl. You take care and be good to your Mommy now, Pepper and Bonnie, and Fa-fa too. 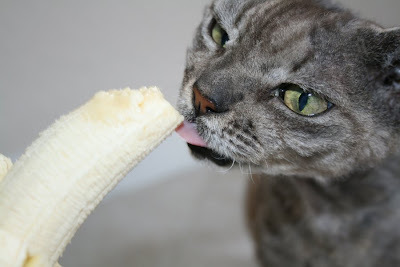 I'm gonna eat a 'naner in honor of her...I've never had one, so its going to be an extra special treat...just like Pixie was an extra special kitty. I'm so sorry for your loss. My hope is that you will eat lots of bananas and think fondly of that beautiful kitty. I'm eating a banana now just for Pixie. My children want me to tell you they are sorry for your loss also. You are all in our thoughts. We are so very very sorry about dear Pixie. We know she is now happy & pain free & is waiting for you to meet her someday. Of all days, Mama & Papa rescued a kitten/cat that has been hanging around her for a week. Just today they decided to make it a permanent indoor cat. We posted her picture on our blog. Her name is Ruby. Do you have any idea what breeds are in her? Mama & Papa have never had a cat before. We think she is about 6-8 months old. We sure hope you don't get too sad without Pixie. Sending wiry hugs your way. I am so sad to hear this. Tears are filling my eyes; this was my first visit to your blog. I found it thru another cat lovers blog. It is horribly sad to lose a kittycat, which I don't have to tell you. We are cat lovers too and have four. We are so sorry to hear about Pixie. She was a very beautiful girl who was obviously tremedously loved, and that is a kindness that will live forever. Fui, Suey, Evie and Lissa. Oh no... I'm so sorry about Pixie. She had been a very brave girl..